It is of course an immense pleasure and gives us great pride to be able to attend your Congress, and be part of the proceedings with you this week in Cape Town. 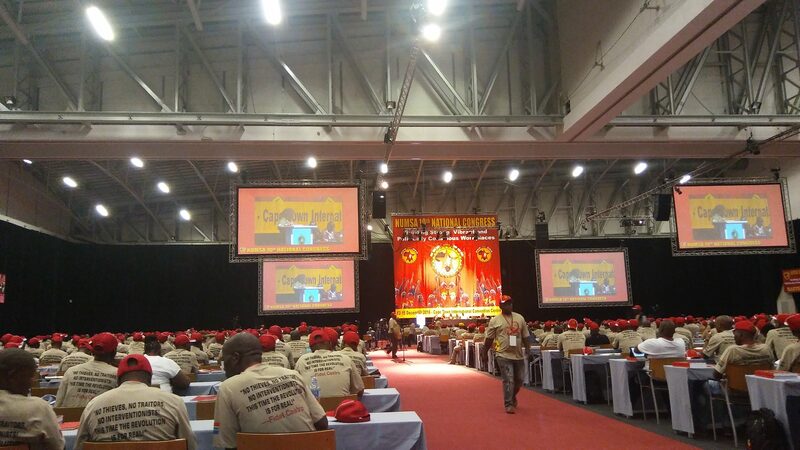 A NUMSA Congress is a significant event in the global labour calendar, and we all eagerly await news of your deliberations, and the policies that you will debate and agree over the next four days. This is the first National Congress after you liberated yourselves from a politics that is devoid of principles and that trapped us all inside a shambolic and dysfunctional alliance that never truly existed after 1994. We are all watching the same unprincipled politics playing themselves out yet again like a broken record. We are seeing the once proud and mighty COSATU playing pure and simply, what can only be described as class collaboration. Behind the backs of workers, they are in the forefront of negotiating a more flexible labour market policy. They are in intimate discussions with the bosses and ruling elites to force workers to ballot before they embark on a strike. They are negotiating a clause on something they have called longevity of a strike, so that in future the right of workers to strike will be diluted, and even criminalised if the bosses believe the strike has been on for too long. Let’s be clear, this is a legacy of Marikana. In Marikana they literally massacred workers back to work, and they know that this caused world outrage. Now they want to be more subtle by using legislation. Let us also note: the Robertson’s Winery workers may not have won the concessions that they did if this legislation was in place. Forcing workers to ballot while a strike is on, is an opportunity for conservative forces, assisted by an anti-worker media, to try and divide workers, and have them believe that they cannot win. But as the Robertsons workers shave shown, solidarity and unity can make headway, even against the most reactionary employers, if workers manage their own affairs without the interference of the State. Comrades we have to be alert. Attempts to control the democratic functions of a union and to interfere with Union mandates are the thin end of the wedge. This is an attempt to undermine workers power, and we must be ready to go to the trenches to defend our hard won rights! Hands off our Unions Hands Off! The class collaborationists are also engaged in a proposal to set the National Minimum Wage at an insulting R3500 when even cautious agencies have stated that a family of four needs at least R5544 just to survive. And they call this a breakthrough! By their own admission, the government has now had to admit that almost 50% of workers are earning below R3500. That is a shocking admission from a Government that claims to be on the side of the poor! On the political front they are again repeating a mistake that we made when we ourselves were part of that unprincipled rubber stamp Alliance. In a desperate attempt to salvage some sort of relevance and credibility, COSATU and the SACP are throwing what little weight they have behind the political ambitions of the ANC Deputy President who is preparing for a titanic factional battle. Please note. This is not a struggle for democracy, but a struggle between competing interests, and that is very different! So we ask which candidate will best serve the interests of the working class. Which candidate will practically support the Freedom Charter? Which candidate will move from the premise that the wealth and land of the country must be shared? Who will ensure that our services and roads will be decommodified? Who will insist that education at all levels will be free, accessible to all, decolonised, dynamic, of high quality? Which candidate will immediately scrap the NDP in particular its economic policies that seek to maintain the status quo and put an end to austerity measures? Which one will be prepared to build an active developmental state that will introduce strategic nationalization in order to access the resources we so desperately need for free education, free health care, industrialisation, and an infrastructure that meets the needs of our people? Which one of these candidates will introduce a 40-hour working week? Which one will ban labour brokering? Which one will build houses that can give the poor dignity and services, and be near their places of work? Which candidate will actively pursue those who have stolen from the public purse, whoever they are, and refuse to give an amnesty to those who have embezzled our money? We are currently witnessing a very predictable and public spat between Dr Blade Nzimande and President Jacob Zuma with NEHAWU and COSATU yapping like Chihuahuas on the sidelines. But we have learnt not to take any side until we have asked a question – what is this fight about? What are the interests of the working class in this fight? Could it be that perhaps our old ally Nzimande has now shockingly realised that austerity is bad for the poor and that he will be committing political and class suicide if he goes along with a scheme to cut 25 000 jobs in the public service? Is he now putting his foot down and demanding that etolls be scrapped and that it be replaced by a public transport system that is affordable, accessible and safe? No comrades, these fights have nothing to do with all the real issues affecting the working class. This is a fight to decide who will be in a pole position to dispense patronage, and who will be closer to putting their snouts into the feeding trough in 2019. COSATU and the SACP yet again want to use workers not only as voting fodder but they also want to trample them underfoot as they clamber higher into positions of power in Government, and in SOEs and other positions of authority, so that they too can call a swimming pool a fire pool when it is politically convenient to do so. The only thing these unprincipled factions agree on is the delusion that a third force is to blame for the woes of this country of ours! From Gwede Mantashe, Jacob Zuma, Blade Nzimande, Jessie Duarte, Ace Magashula, DD Mabuza, etc. all of them unite behind conspiracy theories to divert attention away from their failure to address the challenges our people are facing. This would be really funny if it were not so ridiculous. Can you believe that from the Presidency downwards, the apologists for the chaos we are in blame imperialism! It is imperialism that is attempting to undermine Jacob Zuma, and the ANC Government. It is imperialism that is undermining the Constitution, not we note, a Presidency that has been condemned in the highest court in the land for having betrayed its Oath of Office! It is imperialism that made Jacob Zuma and Cabinet spend R250 million on his private residence. It is imperialism that enabled the Guptas to land at Waterkloof. It is imperialism that allowed the bureaucrat that carried the can to be promoted to become an Ambassador for his country! It is imperialism that has made Mcebisi Jonas, Vykie Mentor and a host of others to say under oath that the Guptas offered them Cabinet posts! Now, all of a sudden, it is Imperialism and white monopoly capital that are the cause of the whole political crisis in South Africa. How convenient! Let’s remind them of the real crisis of South Africa! Unemployment has reached 37% and you comrades have failed to address that! Poverty has reached 54% of the population and you have no plan to address that. We have become the most unequal society on earth and this happened under your watch! Our education system is in deep crisis both at preschool, basic and tertiary levels and you have ignored your own policies just because your own children are in the private schools. Our hospitals have become mortuaries. Our rural areas, towns and townships are a see of deprivation the face of neglect of crime and other social ills. What we can say is this, if a Third Force does exist, can we suggest that those who are looking for it: look no further than the secret shebeen in deepest Saxonwold! And please, stop insulting our intelligence with this nonsense! In retrospect, what we can say is thank you to those who kicked you out of the federation that you built from its inception. The irony is that those who were kicked out were your recruitees and trainees. Congratulations NUMSA for being kicked out and in the process liberating Zwelinzima Vavi and probably millions of other workers from those anti working class politics. The doomsayers, who said that NUMSA would shrivel and die after being expelled from COSATU, are all starting to ask themselves serious questions today. 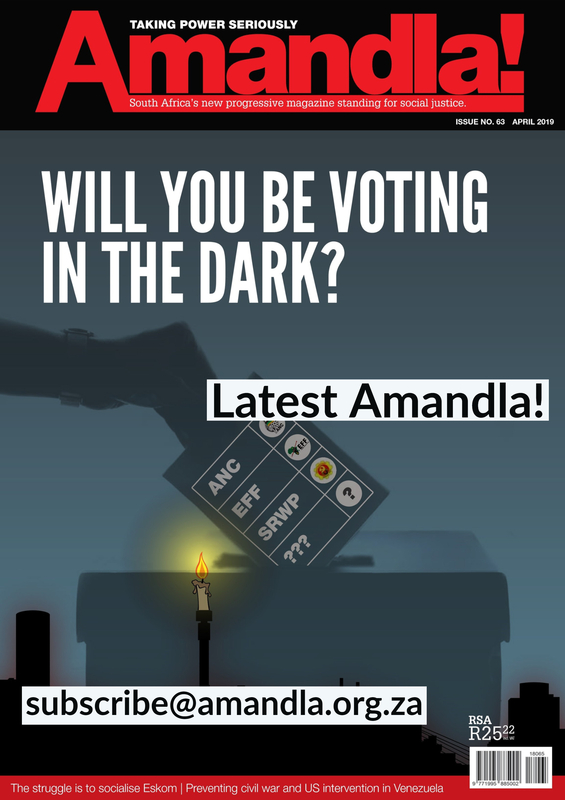 NUMSA instead of being a flickering candle in the wind, struggling to stay alight, has instead become a beacon of hope in the chaotic and unpredictable sea we call South Africa today. NUMSA has withstood all manner of attempts to undermine it, to separate its democratically elected leadership from the grass roots membership. It has been accused of being divisive, disruptive and destructive. Its leaders have faced attempts at character assassination. Its shop floor representatives in workplaces have faced attempts to split and divide workers unity, and the general public has been treated to attempts to trivialize the very bold but practical politics that the Union has promoted. NUMSA has not only survived but has and in fact continue to grow notwithstanding the jobs loss blood bath, precisely because its mandates are not decided by a small clique of unaccountable leaders as they are in many unions, but are created by one of the most rigorous democratic processes. NUMSA leaders, at all levels have a deep seated respect for the mandates that they are given by discussions that take place from the bottom up of the Union. More than any other union, NUMSA has established a culture of democratic participation and decision making that would put most bourgeois parliaments to shame! How many delegates in this Congress have not discussed the policies and resolutions that are being debated at this Congress? None! How many delegates are seeing documents for the first time? None! How many delegates at this Congress have not engaged those they represent? None! How many delegates intend to disregard the mandates they have received? None! This is the vital difference between NUMSA and many others. This is the culture we have come here to urge you not to weaken going forward. NUMSA survived the NP apartheid government onslaught on unions in the 1980s because of this culture. When that regime unleashed violence that often turned worker against another worker. NUMSA members in the hostels of Gauteng and KwaZulu Natal refused to resign from what they called uNomsa intomb’emhlophe. Even when Blade Nzimande, Jacob Zuma and Sidumo Dlamini hired Cedric Gina to divide this union, NUMSA members refused to leave their union. There is no replacement to service. NUMSA is a true pace setter with innovating ideas on advancing the interests of workers in the workplace and in society. It has attracted the best of staff and trained its organisers and other union staff members. It has been a seedbed for dynamic but progressive political thinking and debates. NUMSA has mastered the politics of tolerance of all left schools of thought and engaged them to reach ideological clarity. So comrades as a long time friends of this union, we have come to plead with you to keep NUMSA unique and to keep being NUMSA! Guard against complacency comrades – don’t drop your guard. The price you are going to pay for your principled ideological stance is permanent vigilance. Guard against arrogance and the “know it all” attitudes. Not a single of us in this hall is perfect! All of us are here to build, but also to learn, and be shaped by the wisdom of others who are also present here. Guard against the rush to label those we have slight disagreements with. Guard against factionalising the union. Guard against intolerance. Guard against closing of the internal democratic space and pigeonholing each other even before we have given time to engage with one another. Say NO to gatekeepers, the phenomenon of sycophancy has nothing to offer to the union but serves as the gossipers and those who tell leaders who are their enemies inside the union. Reject these dividers who whisper in ear to ear with bags of stories that they won’t relate in the open. Beware of the wedge drivers comrades! Fight for the maintenance of principled unity that is based on the model of your dynamism. Building the Alternative is the Answer: Build it now! We have come here as a delegation of the Steering Committee to give you feed back on the work we are doing to build a new federation, that will be democratic, a campaigning federation, independent, but not a-political. When the Nine Plus Unions gathered together to try and defend NUMSA, and later myself as General Secretary, and later still all of those comrades who were expelled from their unions for exposing corruption, we still held on to a belief that COSATU could be saved from itself, and reformed. It was only when we engaged with FEDUSA, NACTU and literally dozens of Independent Unions that the idea came to us that despite our best attempts to reform and save COSATU, the only logical way forward, was to form a completely new Federation. In fact it was the response from mostly Independent Unions that said to us, we cannot go backwards. We have to acknowledge that COSATU is not what it was ten years ago. It is a shell of its former self, and what we need is a new platform, concretely based on meaningful principles, that can over time unite workers from a variety of backgrounds and political traditions. We have made remarkable progress with a new inclusive Constitution, with a series of protocols to guide recruitment and build union cooperation not competition, and that is politically engaged and class conscious, but not sectarian or a-political, that is internationalist and believes in building solidarity within and across national borders, that is determined to support the development of a women’s leadership without being tokenistic, that will actively support workers in struggle, and not just pass a resolution! We have already given notice of a Section 77 to Nedlac for a national strike against the jobs blood bath, the crisis in our entire education system, and the pathetic level of the National Minimum Wage. We have already committed ourselves to mobilising when SONA is taking place, and when the Budget is launched early in the year. We have started planning a massive recruitment campaign, and we are extremely busy building Shop Stewards Councils in every province as the backbone of our local campaigns! We remain hopeful that our friends in NACTU will take a unity resolution at its Congress in July 2017. We have maintained fraternal relations, and are building a constructive relationship with its affiliate AMCU and several other unions that are currently in existing federations. What is interesting is that these developments are not coming from the top, but from workers at the grass roots, who are recognizing in the New Federation an opportunity to break what we have called the Crisis of Representation. What do we mean by the Crisis of Representation? This is not just a South African phenomenon, it has a global expression. Ordinary workers all over the world are asking themselves ‘Who represents our interests’. 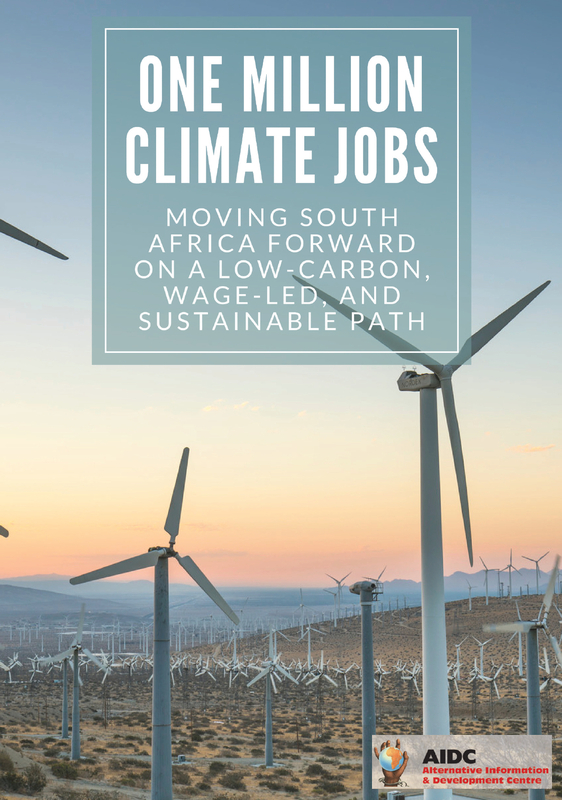 In a situation where it is hard to differentiate between the policies of Democrats and Republicans, the Conservatives and what was Blair’s Labour Party, the Christian Democrats and the Social Democrats, and here in South Africa, the real differences between the DA and the ANC and especially in terms of economic policies, ordinary people are right to ask, where is the alternative? What is the difference between their policies when it comes to creating jobs, ending inequality, dealing with poverty and stopping corruption? In this situation, it is not surprising that millions of workers worldwide either contradict their own class interests or vote for candidates who appear to be anti-establishment and straight talking even if they disagree with aspects of their policies, as in Trump. But perhaps a more worrying phenomenon is that workers stay at home, and do not vote, often in the belief that if voting did actually change anything then it would be banned! This is what is happening in South Africa surely. Let me give you a small example. Do you think that those tens of thousands of students who faced the militarisation of their campuses, who were brutalised and shot by hired bouncers and private armies and wrongfully arrested and brutalised by police tactical support units will ever trust again those politicians who failed to come to their aid, and who instead condemned them when they tried to reform education? This is just one segment of our population that feels betrayed, and has no trust whatsoever in formal politics? What about the hundreds of thousands who have been shot at when march in their communities for service delivery? Will they ever trust establishment politicians again? And frankly, who can blame them for thinking in this way? Apart from a few groupings on the Left, who seem to spend more time criticising each other rather than working for left unity, who else is going to engage them in developing a real alternative. And this is a real danger for our political situation. When masses of people feel alienated from the political processes available to them, they can be persuaded by those whose views are divisive, the xenophobic, the homophobic, the Islamophobic, the tribalist, the racist, the extreme sexists who take it upon themselves to murder young women just because they happen to have a relationship with another women. Do we really want to descend into this type of politics comrades? Do we really want to see our children brought up in a society that glorifies exclusion and discrimination all over again? I don’t think so. That is why NUMSA’s deliberations are so very important for all of us. You have an opportunity here this week to restore hope in a socialist vision of our country, our continent and our world. You have an opportunity to show that when workers become democratically organised they can withstand the onslaught of the capitalist class. You can show by example, how to build linkages with other workers and how, when we work together as unions in the same sector that we can reach out to the 7m workers, out of 10m in the formal sector who are not even in Unions. You can be part of a new beginning, and build a New Federation that reaches out to the unemployed, and that makes common cause with the millions of workers who have to resort to the informal sector in order to survive and feed their children. These are the challenges that will face the New Federation, after it has held its Founding Congress in March next year. We expect you to spend this four days understating and appreciating its historic nature. Workers across the globe are waiting. South Africa is waiting! They waiting for practical steps they can rebuild their beautiful land and give hope to humankind again that another world to this barbarism and chaos is possible. 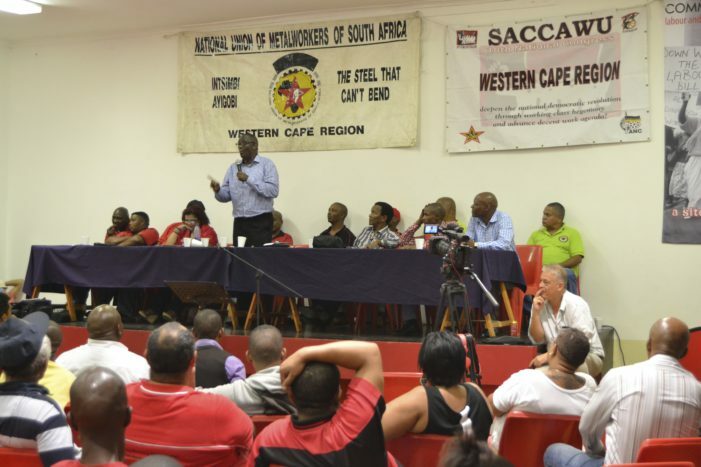 NUMSA you have no option – failure is no option for you. We wish you best of luck.